The Megaupload founder is building a new massive global network that will "turn this world upside down". Kim Dotcom may have lost the company that was once responsible for 4% of all internet traffic, but that hasn't stopped him from preparing an alternative to his seized file hosting empire. Dotcom has provided details on what to expect from the next version of Megaupload, promising a network that will be bigger, better, and faster than before. The former internet mogul stated on his Twitter account that he was "building a massive global network" that would be more open than the previous one, specifying that "all non-US hosters" shall be given the ability to connect servers and add bandwidth to the upcoming solution. Dotcom also mentioned the network's new API, calling out to any interested developers. "The Mega API will provide incredible powers. Our API and your Mega tools will change the world," he said. Dotcom also reached out to people involved in email and fax tools, VOIP, and video applications so he could provide them with early API access, suggesting that the scope of the Mega network would expand beyond file sharing. In addition, Dotcom made promises that the new Mega service will provide one-click encryption to all data transfers on the fly, be easy to use, free of charge, and ensure "total privacy". "They abused the wrong guy," he concluded. "I am going to turn this world upside down. Power to the people. Bye bye Echelon. Hello Freedom." 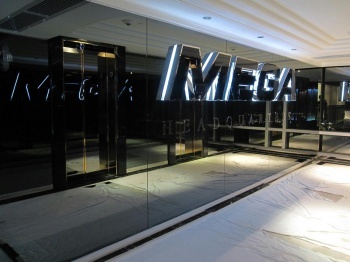 The original Mega network was taken down by federal authorities early this year, and Dotcom was hit with several charges, including allegations of money laundering and copyright infringement. The case against him is progressing slowly, with his extradition to the US delayed until early 2013, and a key judge departing from the case following comments against the US. More details on the proposed global network are yet to appear; as for now, it's clear that Dotcom is not willing to give up his empire just yet.